How on earth did anyone get the idea that people can communicate with one another by letter! Of a distant person one can think, and of a person who is near one can catch hold - all else goes beyond human strength. Writing letters, however, means to denude oneself before the ghosts, something for which they greedily wait. Written kisses don't reach their destination, rather they are drunk on the way by the ghosts. Kafka, in a letter to Milena. If kisses fail, how about licks? I've just got back from Brno (CZ) where I bought The Castle. No, not Spielberg Castle, but Kafka's book. Lovely to see that postage stamp. 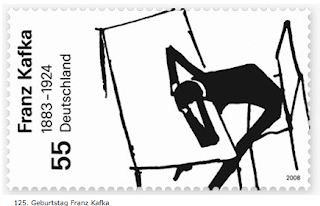 I don't suppose you could place it vertically, or would that go against the Kafka spirit? Placing it vertically would go against the German PO's design. That's how it will appear on letters.